ceases to amaze the people. Many unimagined places are there; one of them is the blood-looking falls in the driest and coolest place to the earth. The Blood Falls, Antartica is one of the most amazing places in the world, which is one of the coldest and driest planets. 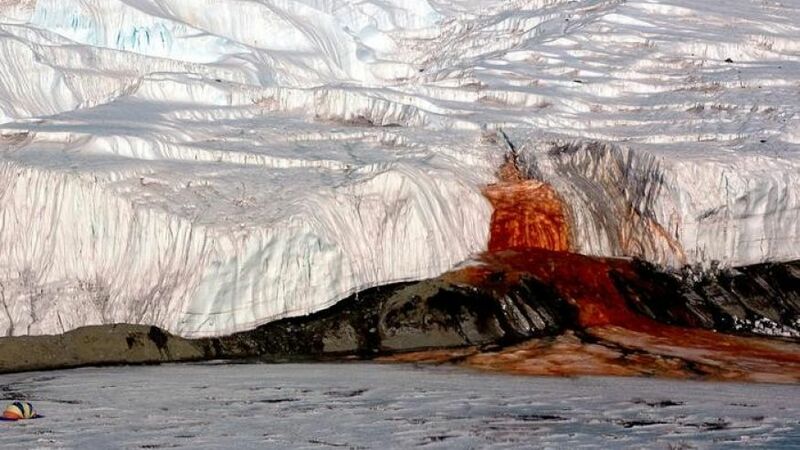 It is surprising to know how this planet has the blood-red waterfall pouring down slowly into the McMurdo Dry Valley, which is the most extreme desert land of the earth. We might have questioned what causes the mysterious flow in such a place? The science has recently discovered this mysterious flow in a study. The scientists believed that for many years the red algae gave the creepy color which makes the red flow which exactly likes a blood-flood. Further research has found that that is due to the iron oxide, which is responsible for the hue of which the waterfall even contains the lifeforms of much mysterious bacterial. The Antartica is the land extreme and fifth largest continent. Which is located in the southern pole. The visit of this planet is only possible by commercial voyage for the seashore, specially mounted land expeditions, sightseeing by air.